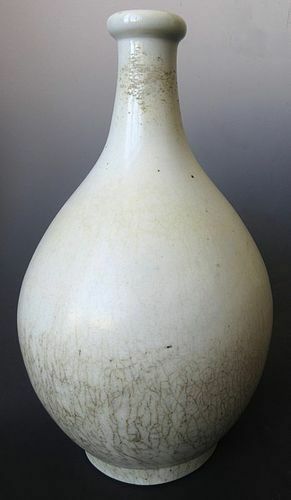 Antique Korean glazed bottle vase. 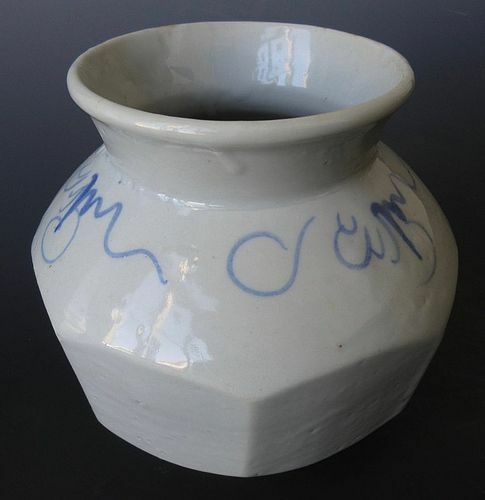 Pear shaped rising to a tall neck with a slightly everted rim and applied with a glossy transparent glaze. Fluted rounded rim with natural design. Would have been used to store choice fluids. 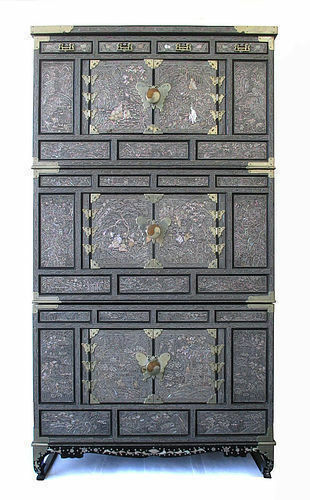 Choson period circa 1850s. 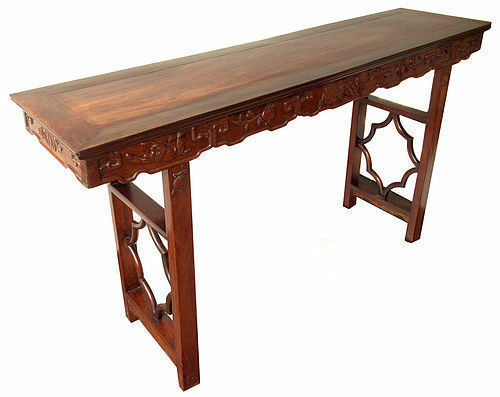 Chinese Huanghuali altar table, with distinctive, natural "ghost eye" grain, carved with gourd, Buddha's hand citron, peach, and scrolls motifs, recessed scroll legs with star motif, Early Republic period. 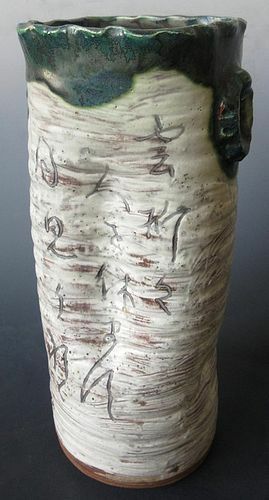 Japanese oribe ware tall vase for ikebana (flower arrangements), with calligraphy inscription in front. 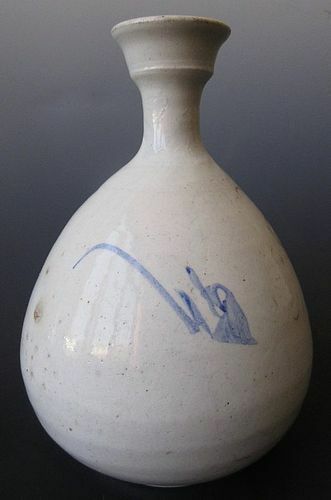 Circa 1950, bottom marked "Nishikawa Kyomo", "made in Occupied Japan". 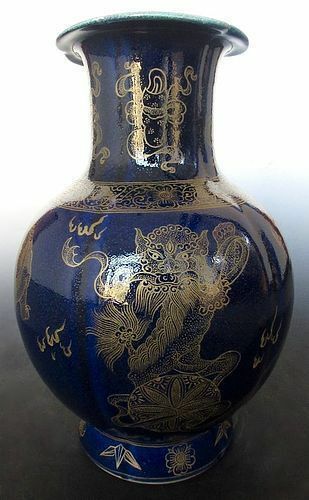 Antique Chinese monochrome deep blue vase, the body of a melon form with a foliate rim, decorated with ornate gilt motifs of guardian lions / fu dogs playing with hassled "xiu qiu" balls, floral designs and scholar's objects. 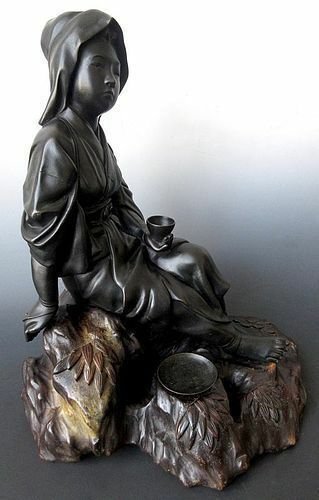 The foot is marked "Qianlong" (1766-1795). Antique Tibetan hand-carved wooden deity mask, most likely of Mahakala, a very fierce and powerful being and counterpart to Kali / Mahakali. His name means "Greater than Time" as he upholds ultimate rule and power over all forces, including time and death. 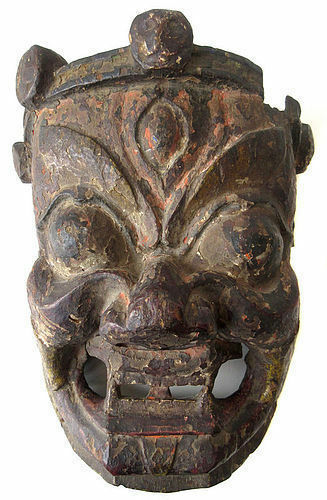 This hand carved mask is indeed very fierce looking, with signs of wear and traces of old lacquer all throughout.